We are Honest & Professional Horse Trainers. Our fee includes feed and thirty honest rides on your horse or colt! We start colts, work with behavioral problems, train rope horses, and will put miles on already started horses. We have an outfitting business and are always looking for horses that we can ride up the trail. They will learn to cross water, bridges, and every other aspect of mountain & arena riding. We spend most of the time riding colts outside of the round pen and arena where they can really learn to deal with life. Over 25 years of experience! References available! We are a full service boarding and training facility serving Salt Lake, Park City, Layton, Morgan and Ogden, UT areas. We have a 60′ round pen. We have outdoor stalls. 1, 2 ,4 hour guided trail rides. Western riding lessons. Expect to travel at least once a day to care for your horse, clean stalls, and to supply everything your horse needs but the shelter and fencing. Water is available but you might have to provide a trough or buckets. You’ll have to purchase and bring in your own feed and bedding. 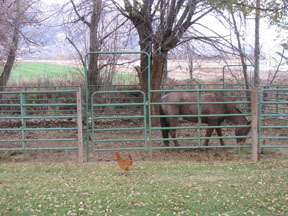 Horses may or may not be checked every day, depending on the agreement you sign. You will have to arrange for veterinarian and farrier calls. Stalls will be cleaned, the horse will be fed and watered and basic feeds supplied. Horses will be turned out for exercise daily and blanketed (usually an extra cost)according to the weather. Veterinarians and farriers will be arranged by the owner/manager. Lessons may be included in the cost. Hatcreek Outfitters has a staff of very experienced and knowledgable farriers and horsemen. We will do any and all horses, young or old. 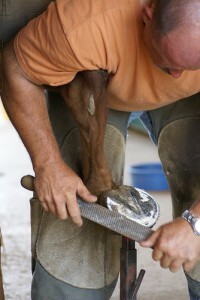 We can also do corrective shoeing upon request. We are very reliable and easy to work with. Please call to schedule your appointment now! We offer Western Pleasure, Horse Driving, Roping, and All-Around Training with basic principles behind all disciplines for a healthy, natural-moving, and happy horse. 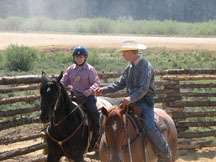 At our facility we teach kids and adults all the aspects of horsemanship. 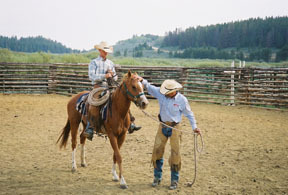 From the halter to the saddle you learn the responsibility of owning and caring for your horse. We also offer summer camp for the kids where we also take our students on long trail rides as we believe it builds confidence. This is an outline of what you will learn & practice in our beginner/intermediate lessons. Grooming for pleasure, show and competition. Horse exercise based upon horse’s age and condition. Identifying horse health and soundness problems. Judge feeding needs and consistently intrepret. Be able to de-worm and give basic medications to horses. 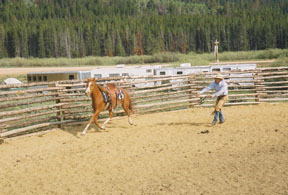 Understand and be able to demonstrate controlling horses of various stages of training for vet/blacksmith, etc. From beginners to advanced, youth to adult, our techniques will help with which ever discipline or riding styles you choose. We train you to train the horse, while enjoying a private, quiet learning atmosphere. We excel in matching horses and riders. 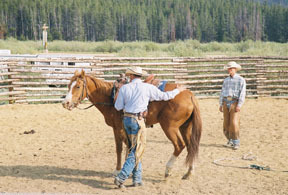 At Hatcreek outfitters we have excellent lesson horses for all ages and levels. Call now and schedule your lessons. We offer both summer and winter riding lessons. Riding lessons are available for riders age 4 to senior citizens. We have many horses for sale, most are Quarter Horses. We have Geldings and Mares of all ages, sizes and disciplines. Most are ranch and trail horses, we also have some started barrel and rope horses for sale. All of our horses are good minded they have straight legs, good feet and are all gauranteed 100% sound. We have a variety of bomb-proof kids horses that anyone can ride. We have sorrels, buckskins, roans, paints, and palominos. If your looking for a good horse give us a call!